Here’s a pattern modification exercise. 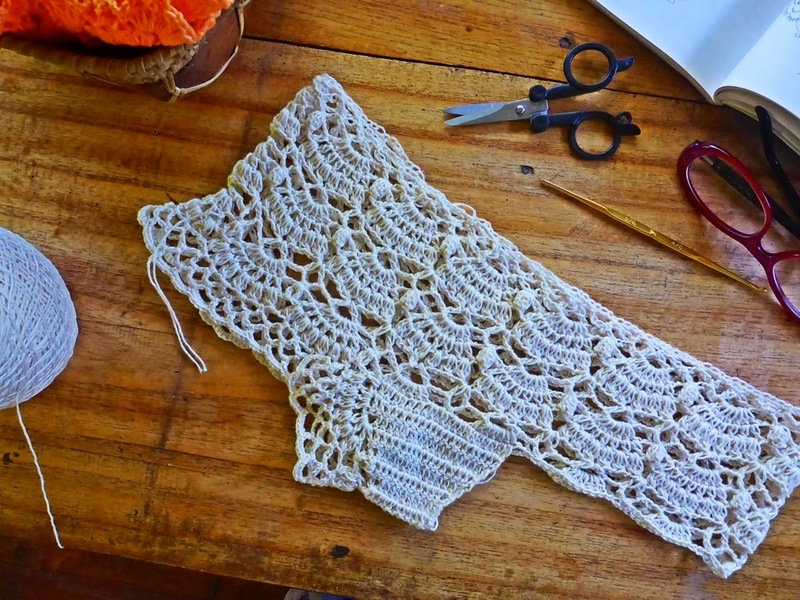 Given the pattern for a capelet below, make a bra and underwear set. 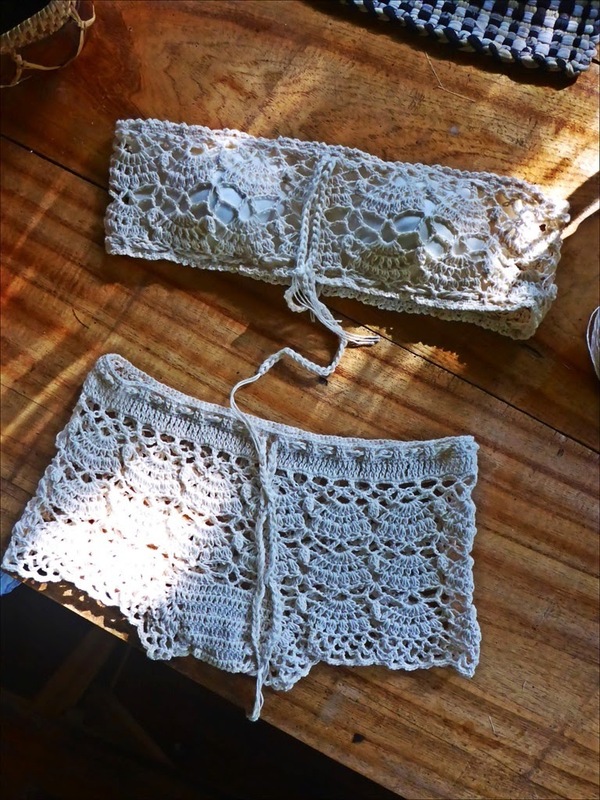 My project, called “Skingerstraat”, is a bandeau and a pair of boyshorts. 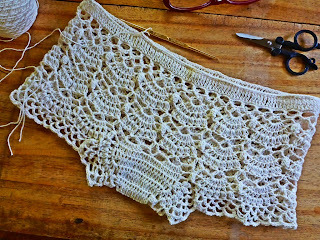 I used 3-ply cotton yarn and a 2.4mm hook. 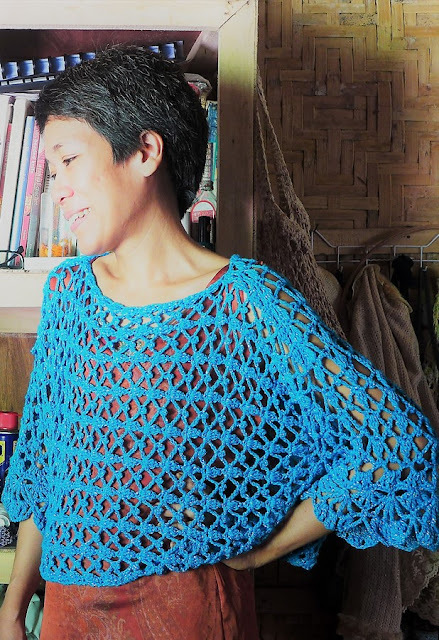 The capelet is from a Japanese crochet book I got several years ago from National Book Store (unfortunately, NBS doesn’t seem to sell these books anymore…). 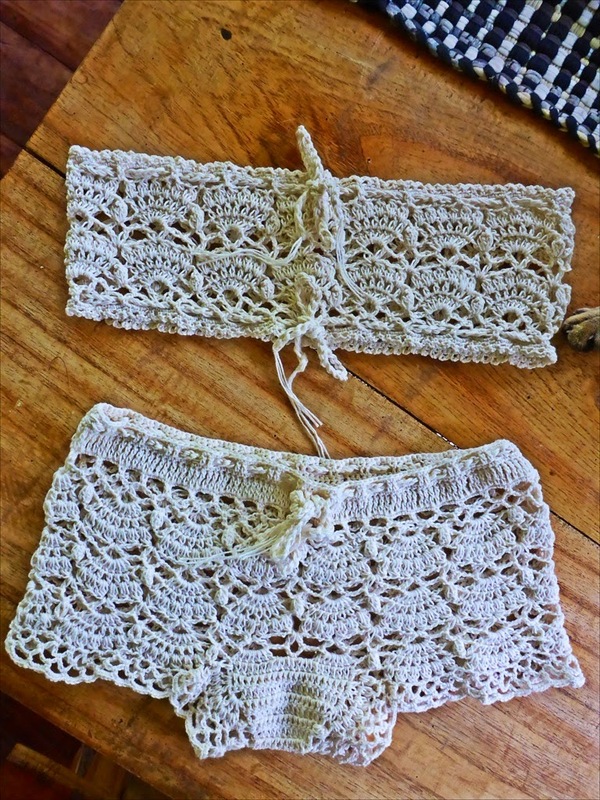 The book is a collection of autumn and winter crochet garments. 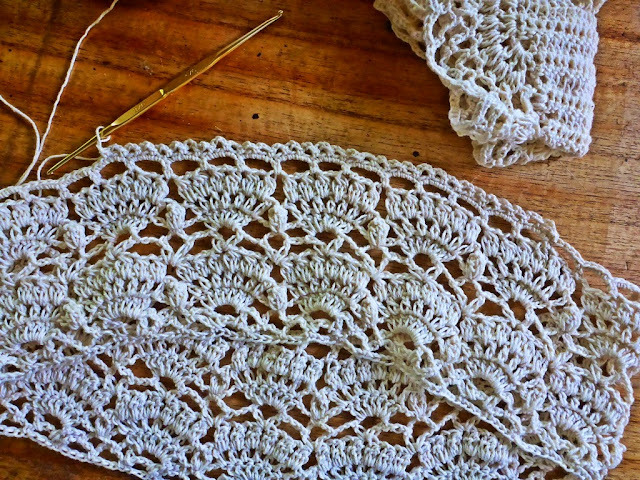 Although I can’t really make these items for use in a tropical country, I buy pattern books like these because I can always use the patterns as base or inspiration for my own projects. 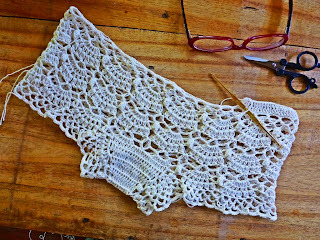 Anyway, the challenge ion “Skingerstraat” is to take the scallop section of the capelet pattern and modify it so that it is worked in the round. 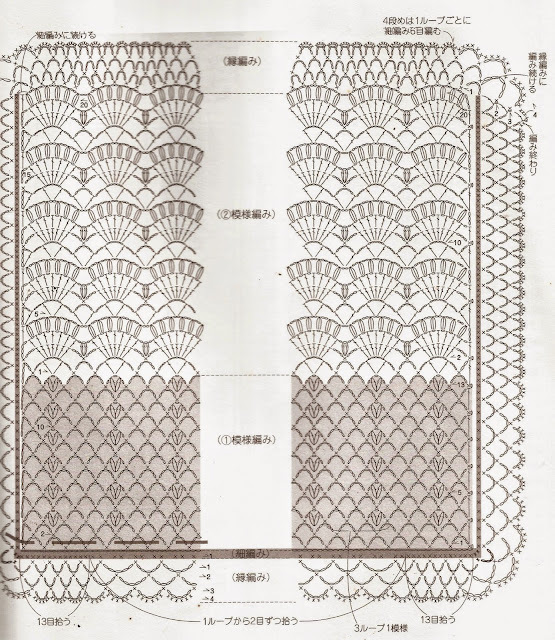 You may take other parts of the pattern to make your own design. 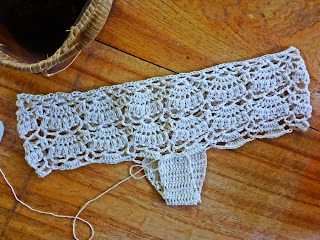 The other challenge is to work the scallop pattern over a different base of stitches. 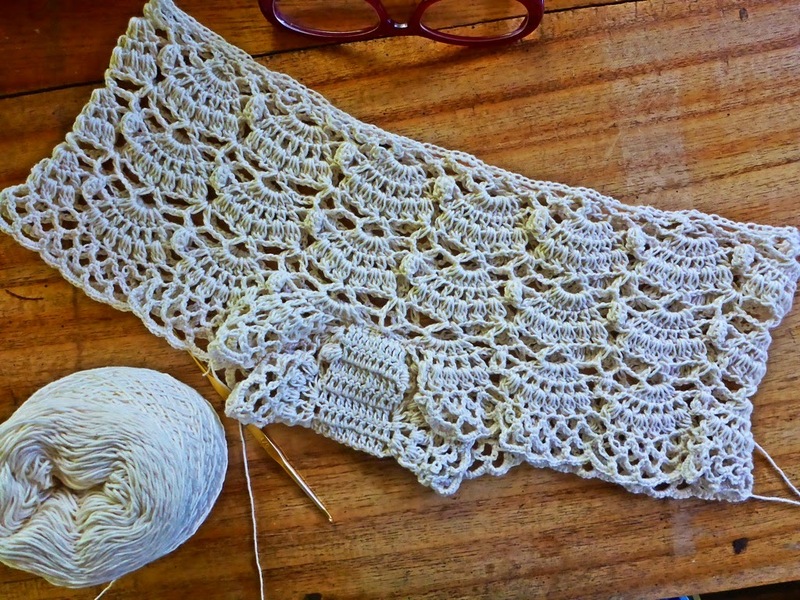 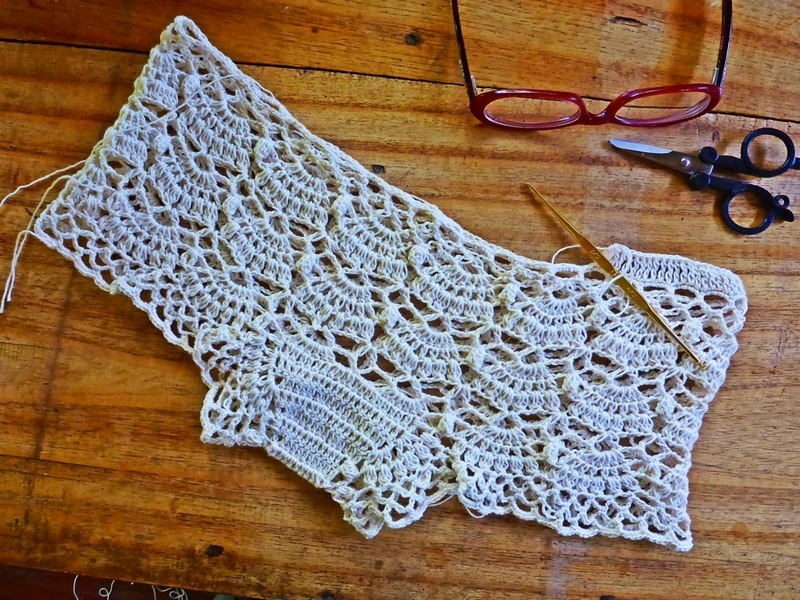 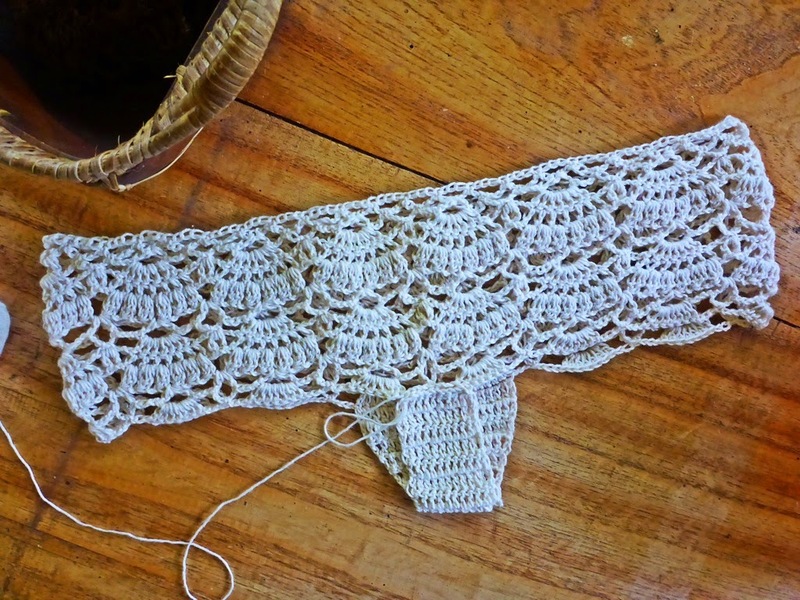 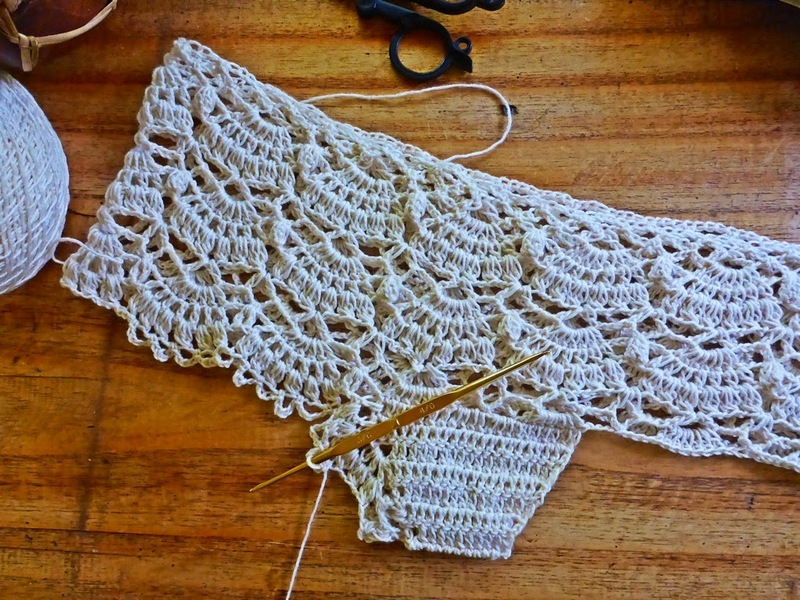 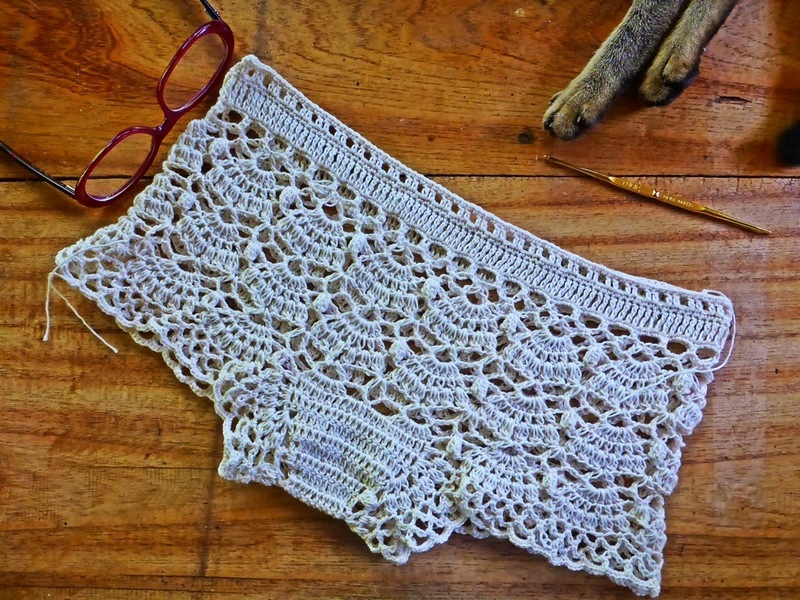 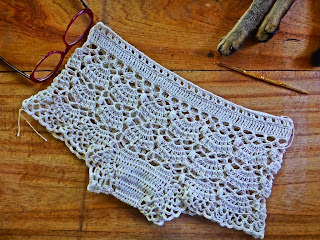 The trick here is to count stitches and work in those stitches in such a way that the integrity (size, shape, etc) of the scallop pattern is maintained. 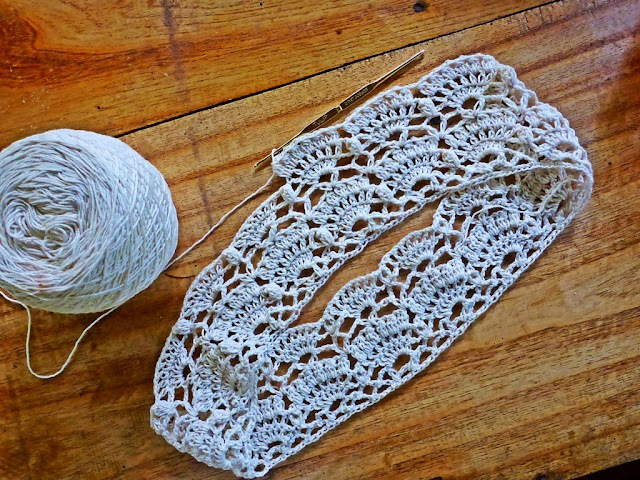 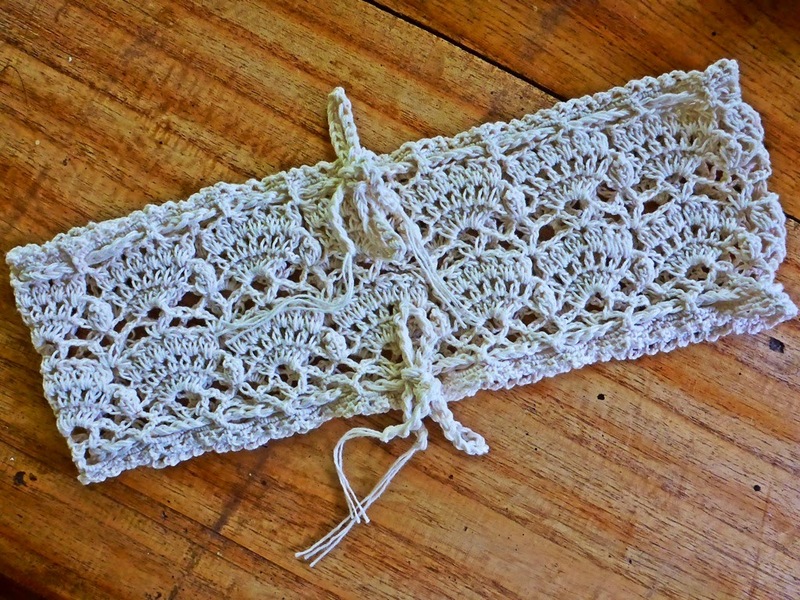 “Skingertraat” is about crocheting without a fixed complete pattern – to learn to modify, to be spontaneous, to use the hook and yarn to make a line that can go anywhere you want, to make the shape you want. The bandeau is very easy. 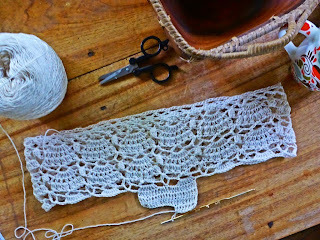 But the challenge here is to modify the pattern so that it can be worked in the round. 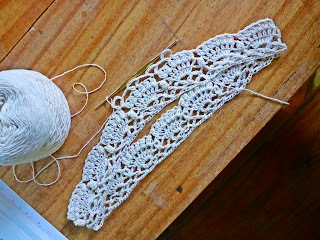 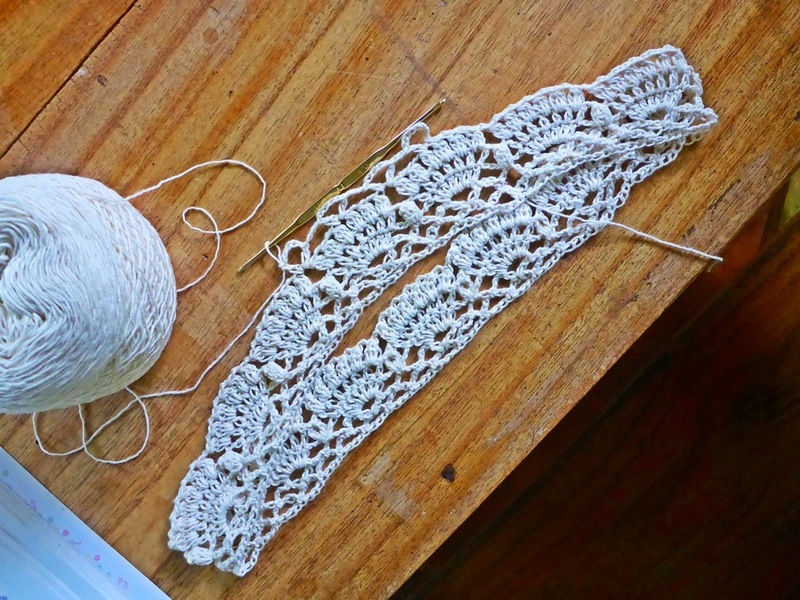 Start with a foundation chain of 13 stitches for the pattern repeat. 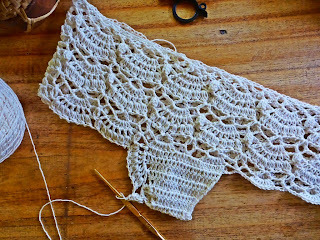 This is also easy, like doing the bandeau. 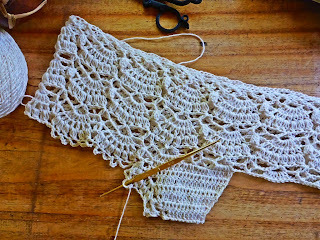 The hard part is perhaps working the pattern all around the leg openings. 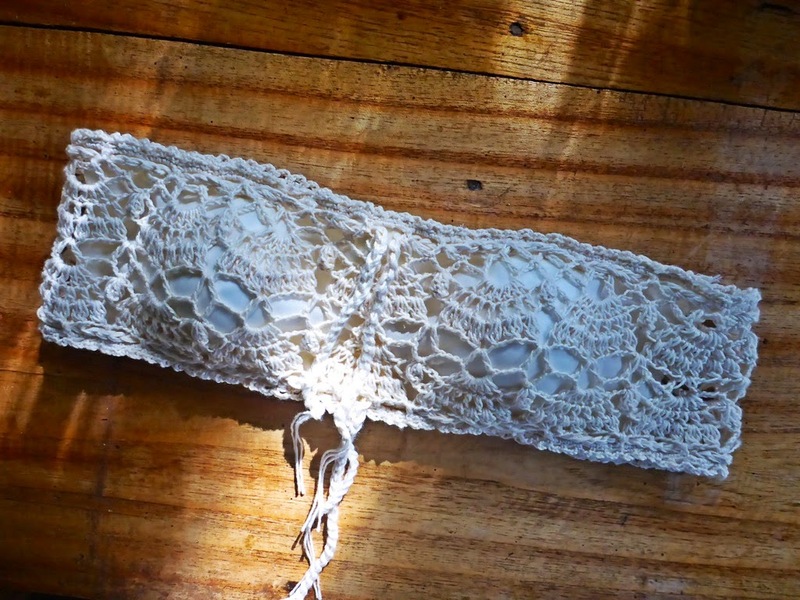 Don’t be afraid to improvise. 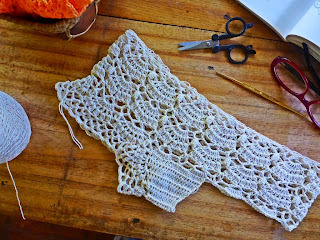 Rip and repeat until you get it right.